A little more affordable, reduced accessory support, attractive frosted design. New in 2017: The Nest Thermostat E is a lower-priced alternative to the category-defining, award-winning Nest Learning Thermostat. Known formally as the Nest Thermostat E, the “Nest E” is a fantastic update to the Nest family of smart home products. It fills the “under $200” niche that competitors Ecobee and Sensi have largely had to themselves for the past couple years. Now, it’s game on as this MSRP $169 Nest brings nearly all of the same features as the full-featured Nest (which retails for about $80 more than the E). This model features a softer, fuzzier screen meant to evoke the look and feel of watercolor on a white canvas. If you thought the original Nest was just too shiny, here’s its opposite. The twist dial is the same (albeit a little lighter-weight feeling), and the “learning” algorithms that helped make Nest famous in the first place are still here, as well as the polished app and integration with other Nest products. All that’s missing is support for certain combinations of HVAC accessories support and the Farsight feature that responds to your physical presence. 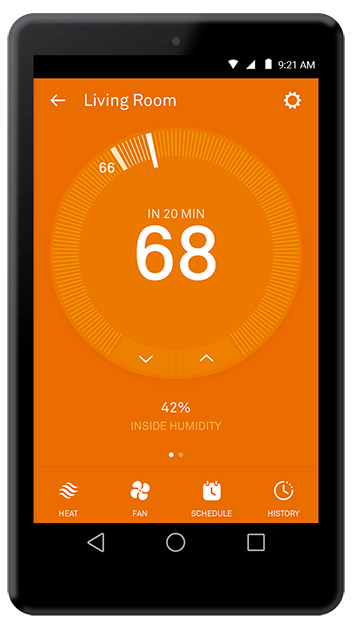 Another pro: the Nest Thermostat is pretty and eye-catching in a good way. The screen automatically dims after a few moments of inactivity. For years, Nest invested in expanding its product family (see: Nest Protect smoke and CO2 alarm, Nest cameras) and updating its original Nest hardware. Meanwhile, competitors Ecobee, Honeywell, and Emerson were busy rolling out their own WiFi-enabled thermostats that brought a similar feature set at much lower price points. But Nest’s strengths have always been simplicity of use – it is still the only smart thermostat on the market that you don’t have to explicitly program (but you can, if you want to) – and physical design. The Nest and the new Nest Thermostat E are simply beautiful to look at and touch. The twist ring feels natural, more intuitive than on-screen sliders or arrows (especially for some older folks). That’s why it’s so exciting that Nest has finally created a “budget” priced smart thermostat that still captures what made the original Nest such a phenomenon. And it’s not just a “here’s the same thing but cheaper” effort – no, it’s a fully-fledged product, a part of the Nest family rather than just an affordable alternative in a cheaper body. One might wonder if the frosted, unobtrusive look of the Nest Thermostat E actually represents an overall shift in the design philosophy behind Nest products. 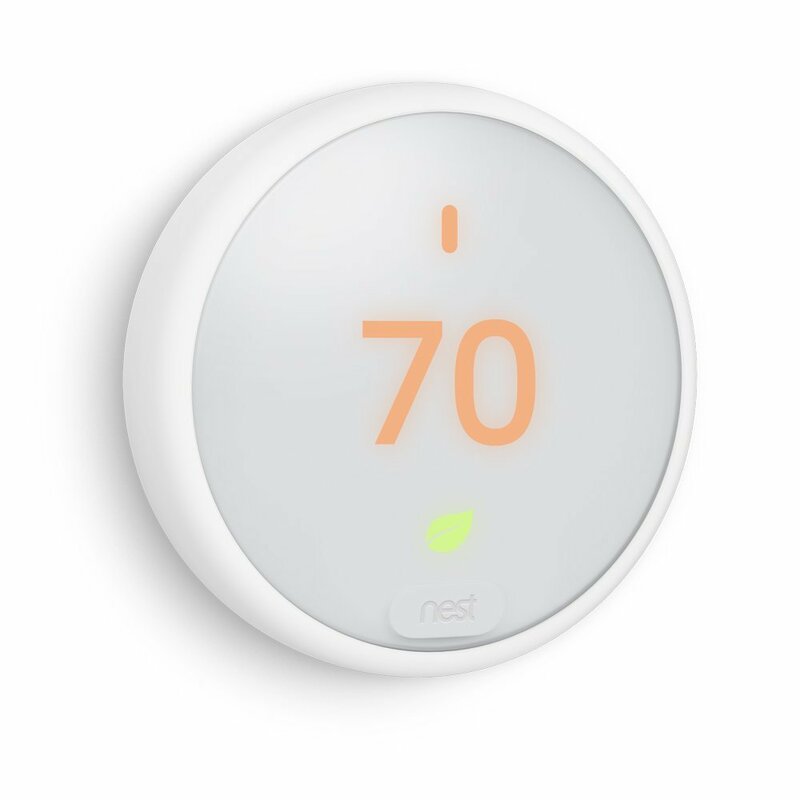 Much like a company changing its logo typeface every once in a while to stay modern, the new “watercolor” inspired look might be the future look of Nest thermostats in general. While the full-featured Nest has a ‘white outer ring’ option, there’s no way to get the gentle, frosted look on a full-featured Nest (yet). The Nest Thermostat E is a direct competitor to ecobee’s budget-option thermostat, the ecobee3 lite Smart Thermostat. 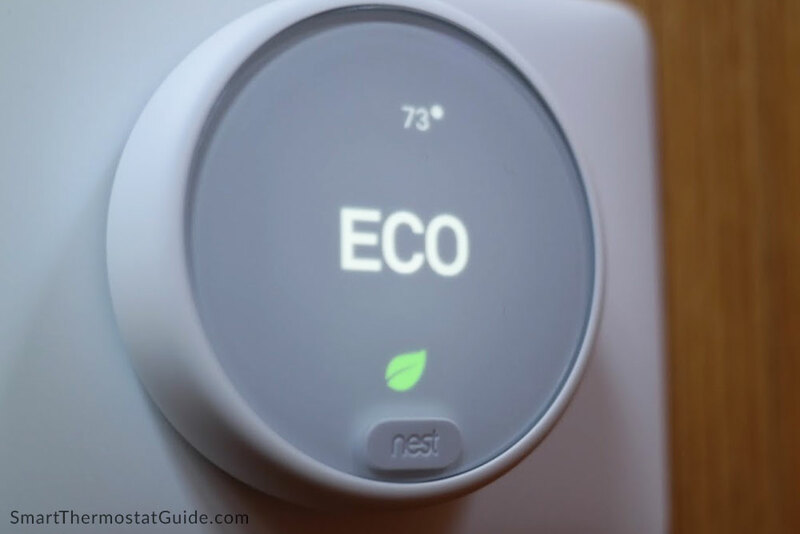 Both are excellent products that represent several years of design iteration and improvements, but there are some nuances to be aware of if you are deciding between a Nest E and an ecobee3 lite. 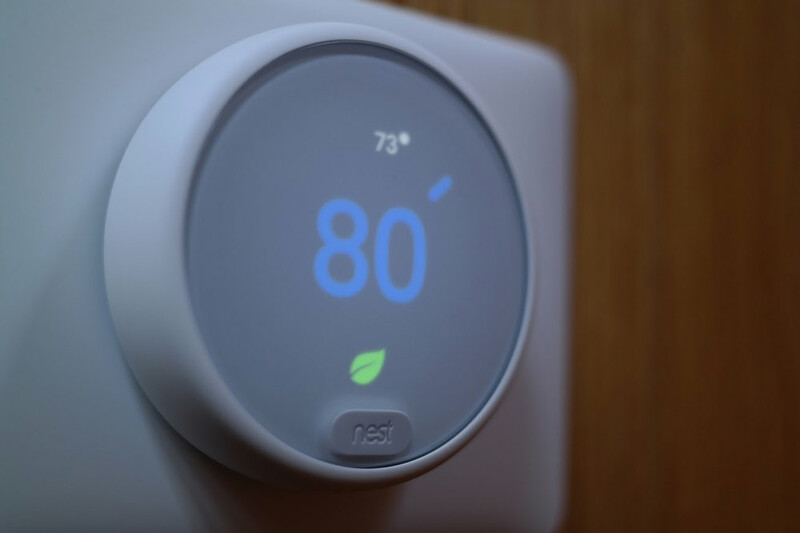 The Nest Thermostat E features the well-loved outer ring design and a frosted white glass screen. The screen is bright and easy to read, but the overall experience is meant to be “set it and forget it” so you won’t spend much time tinkering with the unit once it’s set up. We thought the screen was beautiful and unobtrusive. It won’t light up the whole room or blind you in the middle of the night with its brightness. Compared to its direct competitor, the ecobee3 lite, the Nest Thermostat E’s screen is a bit fuzzier but the large ring makes it super easy to interact with, even for people with limited vision or mobility. The twist ring is intuitive, and easier to grab than an on-screen slider. Which one you prefer is just personal preference, but we’ve found that elderly people and people who aren’t really tech enthusiasts (people who “just want something simple that works”) tend to favor the Nest. When it comes to c-wires, the answer is: it’s complicated. Nest will tell you that the majority of installs don’t require a C-wire, but if any of these scenarios start happening, you’ll have to go back and add one. We think this is confusing and makes it harder for buyers to make a choice as to which thermostat they want, knowing there’s a chance the Nest may look like it’s working with their system… until it’s not. 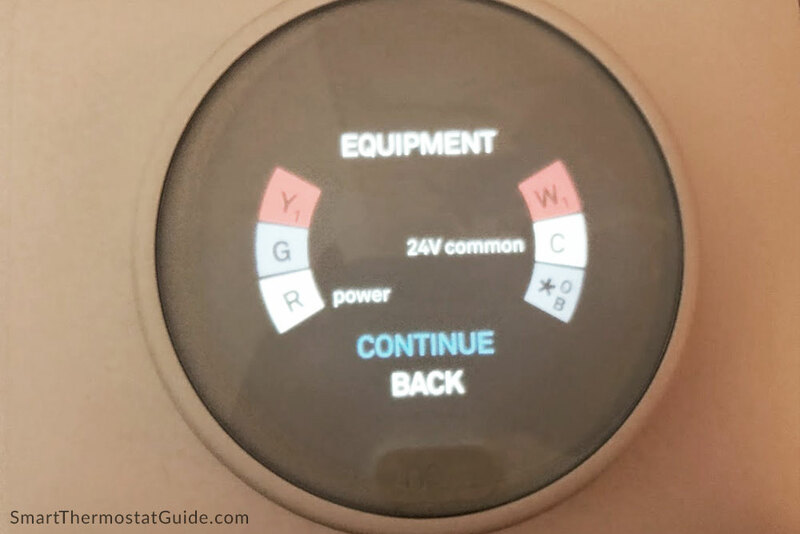 The Nest Thermostat E is designed to charge itself using the heating and cooling wires, but it’s not easy to know upfront if your particular HVAC setup will be able to do that or if you’ll end up with weird furnace noises and heat running when it shouldn’t be. Ecobee, however, just makes a c-wire a hard requirement for all of their thermostats and includes a Power Extender Kit with every thermostat. See our full Nest E unboxing post here. Unlike the full-featured Nest, it does not come with a screwdriver (you’ll have to supply your own). When we tried it out ourselves, we got through the installation in a matter of minutes. 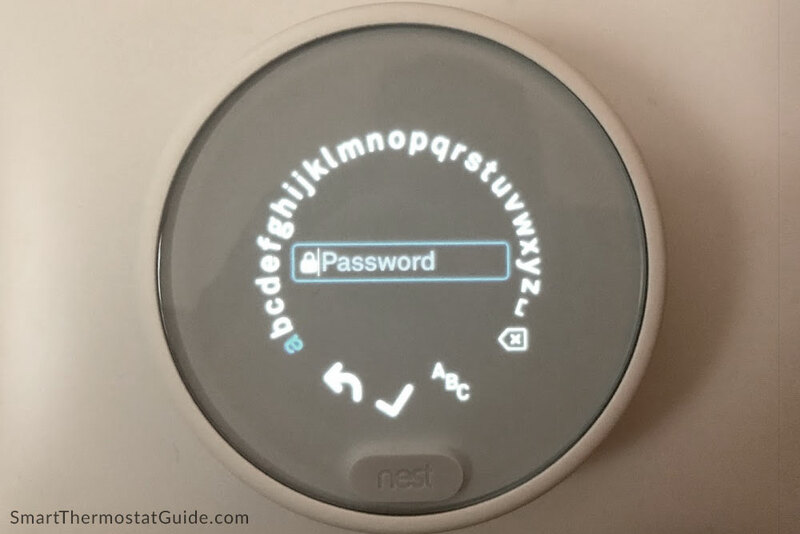 The most time-consuming (and tedious) step was entering our WiFi password using just the twist dial to enter each letter. Nest Thermostat E setup: Pray you have a short WiFi password. To Nest’s credit, they do seem to try very hard to make it a DIY installation. 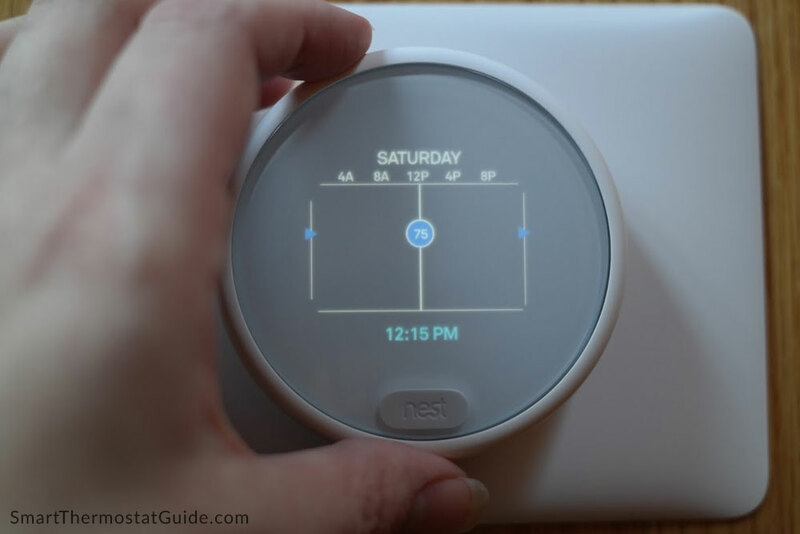 The step-by-step manual is clear and easy to follow, plus there’s also a 6-minute video demonstrating the process on Nest’s website. 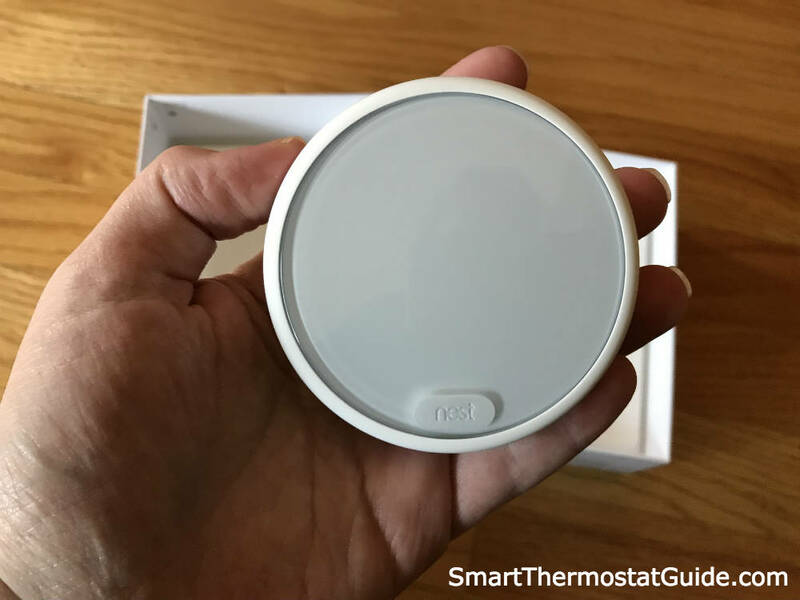 The included wire stickers and tip to photograph your old thermostat’s wiring are helpful, and there’s a support phone line and a responsive @nestsupport Twitter account. Nest Thermostat E setup: we’re missing a heating or a cooling wire. Some of the negative Nest E reviews on Amazon are from buyers who found out the hard way that their wiring isn’t compatible with the Nest Thermostat E. Be sure to check your wiring compatibility by popping your existing thermostat off its base and putting the wires into Nest’s compatibility checker here. This is great for people with consistent schedules; less great if your schedule is all over the place and/or you have people coming and going all day long at your place. We tend to just program a schedule and be done with it, which is easy to do. Scheduling it via the thermostat is a process I wouldn’t recommend. You have to place little “dots” representing temperature changes on a timeline of sorts. If you want to schedule it yourself, it is much easier to do via the app or website. Entering a schedule via the twist ring is slow and somewhat difficult to navigate with precision – use the app instead. Their app is easy to use and is well laid out and modern looking. If you have Nest Protect(s) and/or Nest cameras, it’s great to view them all in the same place. I’ve found the app to be very reliable on my iPhone, less reliable on my partner’s LG G4. Adjusting the temp from your bed or sofa is as easy as opening the app sliding your finger across your phone’s screen. The app supports multiple users, with specific permissions for those users. There’s a nice home/away feature that detects when you’re home and behaves accordingly (adjusting the temperature, disabling cameras, etc, whatever you tell it to). The app can be kind of dumb at knowing if you’re home or not (I’ve seen it be wrong maybe 10% of the time), but when it correctly detects that you’re home, it’s great. We set our rental home up with Nest cameras and Nest Protect alarms a couple years ago and the Nest app has been great for managing all of it. 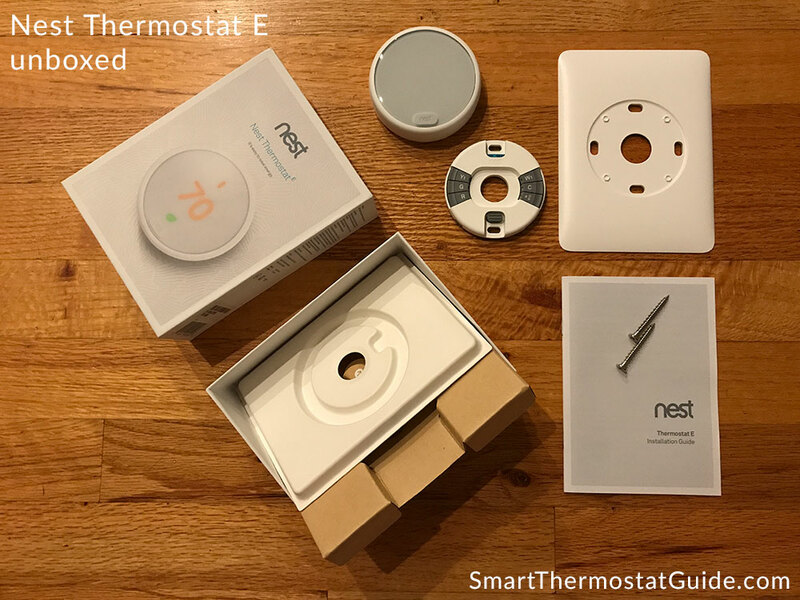 (Unfortunately, the line-voltage heaters and mini-split system at that house isn’t compatible with a Nest, or we would complete the set and install a Nest thermostat there, too). The ring is a no-brainer. Even the technologically disinclined among us “get” the ring right away. When you walk up to the unit, interacting with it is easy and obvious. Just turn the dial and it responds. Some Wi-Fi enabled smart thermostats like to put everything on the screen at once (like our new home’s Aprilaire), which is kind of visually overwhelming and looks cluttered by modern standards. Both the Nest and the Nest Thermostat E hide away the menus and unnecessary information, which we like. The giant number is easily understandable and it glows orange or blue depending on whether the system is heating or cooling. Basically, if you have a “typical” HVAC setup you’ve got a good shot at the Nest Thermostat E working right out of the box for you. That means at least 3 wires, heating and cooling, maybe a fan, and a C-wire would help. 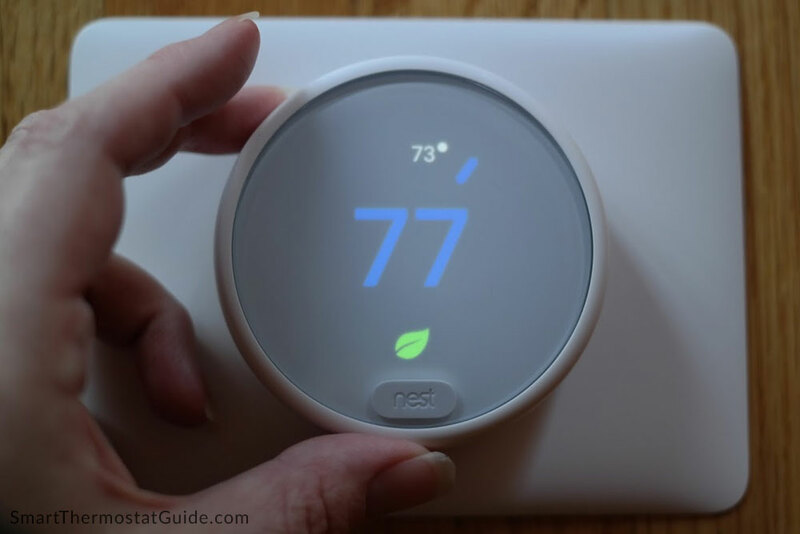 The more “accessories” your HVAC has (such as heat pumps or multi-stage heating or cooling), the less likely it is that Nest Thermostat E will work for you (however, the full-featured Nest offers more wiring options so you might still be able to get a Nest, just not this less-expensive one). Heating and cooling: 1 stage of heating (W1) and cooling (Y1) and a second stage of either heating (W2) or cooling (Y2) (so W2 + Y1 or W1 + Y2). You can check compatibility at Nest’s own website by clicking here. We awarded the Nest Thermostat E 4.5 stars out of 5. We think it’s fantastic. To earn a full 5/5, we think it needs to support a slightly greater variety of HVAC systems. We wanted to put it in our home, my mother’s home, and my sister’s home, and all three were incompatible (mostly due to those homes having a multitude of HVAC accessories). If you’ve always wanted a Nest Thermostat but the nearly $250 price tag made you wince, the E might be for you. It has reduced support for a few HVAC setups, so be sure to check compatibility against what’s in your home, but it’s got the same great app, the same great technology that saves homeowners 10-15% on their heating and cooling costs, and it sure is fun to adjust the temp without getting off the sofa. Installation is easy, assuming your system meets compatibility recommendations, and the Nest app is (usually) a joy to use. It might seem a little weird to care about how your thermostat looks, but we can’t help but smile a little every time we got to try out the Nest Thermostat E.
It’s beautiful and easy to use – we just wish it had more accessory support. Woah, I didn’t realize that a Nest could lower 10-15% percent on heating and cooling bills. I am trying to see how I can save on all my monthly bills. This would really help l but I don’t want to deal with wiring so I am going to look for an ac installer.